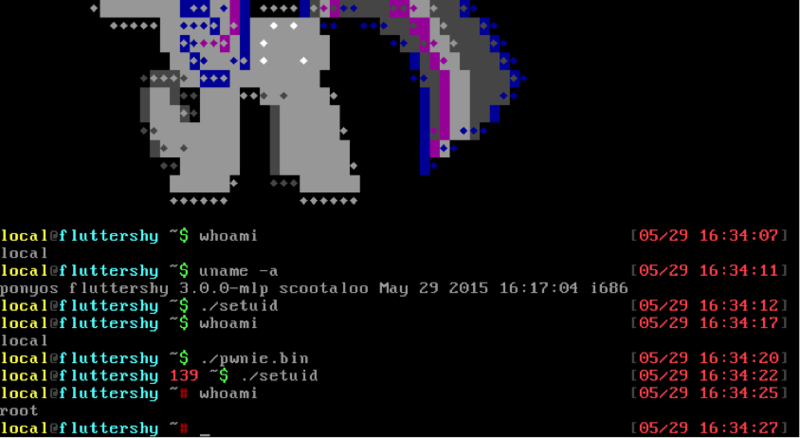 PonyOS is a hobby Unix-like operating system that uses it’s own kernel, built from scratch. This makes it a great research target for exploring software exploitation concepts. The OS is actually a variant of Toarus written by Kevin Lange and this post is relevant to both variants, however as the author prefers ponies we will stick to referring to it as PonyOS. I decided to attack the OS by reviewing some of the kernel code as a limited user-space environment is provided with very limited user separation and no real attack surface. Auditing the PonyOS source code identified a number of vulnerabilities such as a lack of bounds checking in memory allocators (e.g. in sbrk()) to a lack of checking permissions on the file system (e.g. https://github.com/HackerFantastic/Public/blob/master/exploits/rarity.c)! Here is one of the more interesting vulnerabilities and the steps taken to exploit it. In theory it should therefore be possible to overwrite the JNE instruction at 0x0010f103 and evade the privilege check. By crafting an ELF executable with a section header address of 0x0010f103 (sys_setuid location within our kernel image) it is possible to write two NOP bytes into the syscall, allowing any other process on the system to obtain root by calling our modified function. The syscall ISR is 0x7F on PonyOS and the syscall number is 0x18. We wrote a simple ELF binary generator, rainbowdash.c, which when run will output a malformed ELF binary that abuses the write anywhere primitive to perform this patch. You can download our exploit for educational purposes here. The screen shot below shows an example of the exploit being run and the “setuid” code being executed which simply spawns a shell after executing the patched syscall.